Latham Marine is the only choice. 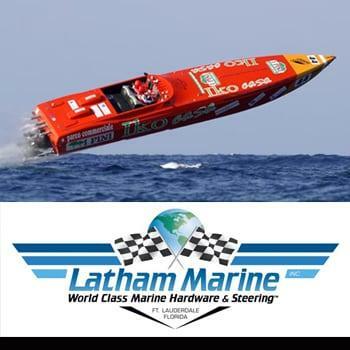 Best known for its high performance hydraulic steering and tie-bar systems, Latham Marine has out-paced any competition and is internationally used by top racing teams, performance boat enthusiasts and people who take “pleasure” boating seriously. With over 10,000 parts and 7,000 components, including drive accessories, trim tabs, controls, lifts and hoses and fittings, all engineered in-house and built in the USA, Latham Marine products are hard-tested in the most brutal environments, resulting in robust, ultra-reliable marine hardware. Latham Marine also expanded from performance boats to fishing boats and sport yachts where stronger, better-engineered systems were needed to accommodate the extra power, weight and speeds of today’s technology. The front and side-mount steering systems for the larger outboard Yamaha and Verado engines are now used on all Intrepid boats and are the steering of choice for discerning boaters. Latham Marine’s first lift system was used exclusively by Thunderbird boats and the company’s newest remote-controlled hydraulic lift system with fully encased cables and hoses is available to boat builders or after-market customers. In addition to being a financial sponsor for Caddy For A Cure, Bob and Kathy Latham are incredibly patriotic and giving to various other charities in the USA. Please CLICK HERE to visit Latham Marine.